I have not been one of those people in the media technology world who view the iPad as the Thing That Will Save Publishing. My iPhone experience has been occasionally frustrating and inconsistent but I still wouldn't go back to the Blackberry. Unlike others I know (e.g., Sedentary Man), I refused to buy an iPad because I didn't understand it from either a value or utility perspective. Imagine my surprise yesterday when my IT person stopped by with a white box containing a shiny new iPad, courtesy of the CIO. The first thing I did was boot it up and look at The Emerging Runner on the browser (no Flash - argh!). The second thing I did was go to iTunes to see if they had any interesting running apps. Not much there. AG kidded me that I really shouldn't run with it (besides there's no GPS!). I was going to use the iPad to write today's post but I found it difficult to position the tablet and type within the confined space of an LIRR train seat. I'm hoping that this tablet will find its place in my technology portfolio. 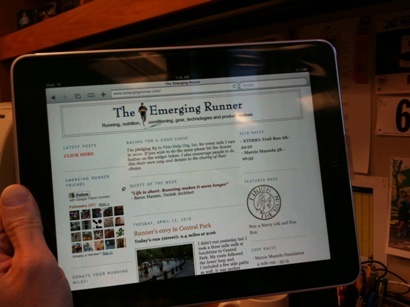 More to come on the iPad/running intersection as things develop. Although I bought a new armband to carry my iPhone on my runs to record time and distance, I still haven't used it. The Garmin FR60 is proving to be a great purchase, capturing everything but a a route map and elevation. It's a much better running watch than the 50 that it replaced. I went out this morning with temperatures reported to be in the middle 30's so I wore an additional layer over my long sleeve tech shirt and was glad I did. I forgot to wear gloves and my hands froze the entire time I was running. I have to believe it was closer to freezing than the posted 36 degrees. The run felt fine, energy level was good and I tried to push it a little near the end. That didn't translate into a fast pace overall but the handy run report on the Garmin confirmed that I did negative splits after mile one. I'm planning to return to the treadmill tomorrow since the weather may be iffy and I haven't used the new machine since it's been fixed. I have plans to run in the city on Friday, weather permitting. Great review. I love my Garmin FR60. Will geek appeal get me to the race? I tortured my banker but, hey, great run today!